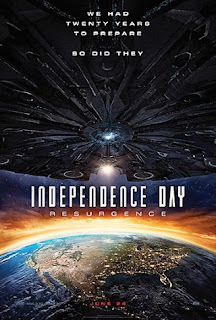 Roland Emmerich is back at it again with Independence Day: Resurgence, his sequel to the sci-fi epic Independence Day. Taking place twenty years after the invasion of 1996, the film follows David Levinson (Jeff Goldblum) as he attempts to prepare humanity for a possible second attack. Since the last invasion, society has incorporated the very alien technology that was originally used to try to destroy them. With these new advancements, many believe that Earth is ready for extraterrestrial war, but when a new ship arrives - one massive enough to have its own gravitational pull - they quickly realize that they are laughably outmatched. 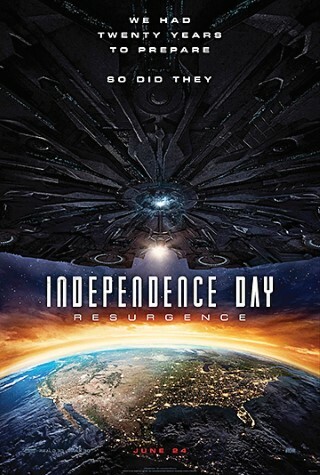 I loved the first Independence Day, so I was desperately trying to keep my hopes high for Resurgence. But the departure of Will Smith, combined with multiple unoriginal trailers, quickly quelled my excitement. And, true to form, the film was a major let down. The worst part, without a doubt, was the acting. Dylan Hiller (Jessie Usher) led the train wreck as the son of the previous movie’s Steven Hiller (Will Smith). Usher’s cringe worthy performance really set the stage for equally terrible acting by just about everyone. Jeff Goldblum was one of the few people that actually played his role well, but it still wasn’t anything spectacular. In all honesty, Independence Day: Resurgence has one of the worst casts I’ve seen in a major movie in a long time. Even the inclusion of Will Smith couldn’t have saved this film. Resurgence also had a tendency to focus on pointless details. One “key” plot point in the film was the rift between Dylan and Jake Morrison (Liam Hemsworth). Their constant bickering throughout the first half of the movie was neither necessary nor entertaining, and it completely took away from the aspects of the plot that actually were entertaining (i.e. the aliens). In addition to these setbacks, the genre itself is being worn out. The thing is, when Independence Day came out in 1996, disaster movies weren’t exactly run-of-the-mill. To give you an idea - some of the most popular films released that year were Fargo, The Birdcage, and the first Mission: Impossible. There were multiple thrillers and dramas, but very few disaster movies. Since then, watching the Earth blown to pieces has almost become commonplace. What should have been shocking and awe-inspiring - watching a 3,000 mile wide alien ship tearing up cities - felt mind-numbing and uninspired. To quote Goldblum’s character, “they always go for the landmarks.” By now, we’ve all seen major cities demolished on the big screen; there’s really no need to go through the motions again. But Emmerich does, and Resurgence becomes a typical, paint-by-numbers disaster movie because of it. In this sense, less really is more. However, the film did have quite a few good scenes. Near the end of the movie, there’s one particular chase scene involving the alien queen and a bus that was fantastic. Overall, the aliens were just the right amount of scary and fantastic, so every scene involving them was great. But, for the most part, Independence Day: Resurgence has a lot more pomp and circumstance than it actually delivers. There’s a reason this movie has a 32 percent on Rotten Tomatoes.